Jonny Greenwood's Bodysong is the first full-length extracurricular project released by a member of Radiohead. We now have audible proof that supposed control freak Thom Yorke hasn't been entirely responsible for the anti-pop tendencies that followed the band's 1997 breakthrough OK Computer. But anyone who's seen Greenwood put his guitar down at a show and hunch over his effect pedals while simultaneously manipulating a transistor radio and a wall of Moog modules could have told you that. 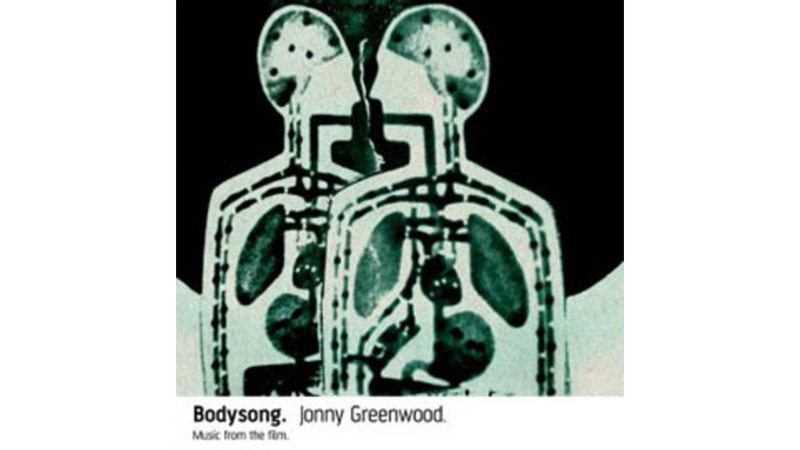 It's important to distinguish Bodysong as a film score as opposed to a "Jonny Greenwood solo album." Simon Pummell's Brit Award-winning film analyzes human life experience in purely visual terms, and this score provides the only "narration." The fact that Greenwood's signature guitar playing appears on only two of the album's thirteen tracks reinforces this project's role of servitude. Regardless, there are plenty of markers to help recognize Bodysong as a Radiohead-related project. The lumbering piano chords of the opening "Moon Trills" reflect back to Amnesiac's "Pyramid Song," the keyboard serving as a relaxing element, even as fluttering violins create mounting tension. Greenwood's considerable use of live strings and horns traces back to Kid A's "The National Anthem," while tracks like "Trench" feature the sonic manipulation and sound masking in the rhythm section that has characterized Radiohead's last three albums. The band’s recent avant-garde flourishes mark the starting point rather than the extreme for this Greenwood project, however. And it's in his use of acoustic instruments, not electronics, where his boundaries are pushed furthest. Jazz-based tracks like the furious "Splitter" compare to David Byrne's recent Lead Us Not Into Temptation (the soundtrack to the Scottish film Young Adam). The gizmos are pushed aside (or at least into the back seat, as in "Milky Drops from Heaven") in favor of several minutes of bebop sax and trumpet scatting over skittering jazz drumming. And the string bass and trumpet give these tracks a seedy nightclub feel. "Convergence" begins with the cacophony of seemingly random beats played on different percussion instruments. After minutes of clatter, the patterns coalesce into a rhythmic whole. The piece then pulses forward like a heartbeat, with all the random systems working toward one common thrust. "Iron Swallow" feels like a step backward in time, with its soothing violin melody courtesy of The Emperor Quartet. The quartet also appears on "Glass Light/Broken Hearts," though during this track, the strings share space with electronic instruments. The song offers a melancholy twist on "Rites of Spring" with its fluttering violin refrain. "24 Hour Charleston" features Greenwood's bluesy, acoustic guitar, reminiscent of recent Radiohead b-side "I am a Wicked Child." Also on hand are plunky banjo, angular electric guitar skronk (pushed well into the background), and Matmos-flavored ambient/rhythmic textures. Brother and bandmate Colin Greenwood provides bass guitar for the track. After the introduction provided by "Moon Trills," "Moon Mall" launches the journey through Bodysong by simultaneously projecting serenity, chaos and clinical detachment. Without having seen the film, one can imagine this piece acting as an audible metaphor for the maternity ward and childbirth. The set closes with "Tehellet," evoking a somber and mournful funeral procession. These two pieces bookend the growth, order, chaos and range of activities and emotions that fall in between. Experience the sound of a life as imagined by Jonny Greenwood, all in the span of 45 minutes.